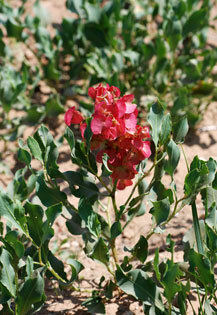 Stems: Erect or decumbent at base, 1 to many, stout, often branching, glabrous, often reddish. Leaves: Alternate, simple; stalks shorter than blades; blades variable, flat, thick, leathery, ovate to oblong or lanceolate, 1.6 to 4.8 inches long, 1/5 to 2 inches wide, mid-vein prominent; margins entire; tips pointed; conspicuous stipules clasp stem at bases of leaves. Inflorescences: Racemes, panicle-like, unbranched or with few branches. Flowers: Flowers tiny, not crowded, small in flower, showy in fruit; flower stalks in fruit slender, to 4/5 inch long, joint near middle; perianth segments 6, in 2 whorls of 3, united basally, more or less alike at flowering; outer whorl turned downward in fruit; inner whorl enlarging in fruit, conspicuously winged; wings .8 to 1.8 inches broad, circular, showy, pink or red; margins entire; tips notched to heart-shaped. Habitat: Prairie dunes, riverbanks and roadsides; sandy soil. Comments: Wild begonia is no relation to cultivated begonias. See pale dock or curly dock.